Jared Adlam is a Session guitarist; Producer; and member of Country instrumental band ‘The Spurs’. Since moving from New Zealand to Australia in 2012, Jared has stamped his mark on the Australian Country music scene, playing with artists such as Toyota Starmaker winners Jared Porter and Kaylee Bell, Aleyce Simmonds, Lost Highway artist Tori Forsyth and many more. From performing on the biggest stages at CMC Rocks, TCMF, Broadbeach CMF and the Gympie muster here in Australia, to Northern California’s largest Country music festival ‘Country Summer’ and New Zealand’s ‘Top Paddock’ festival, at just 25 Jared has already had the privilege of performing at some of the best music festivals in the world. As a Producer and Session Musician, Jared has performed on or produced several Number One radio singles, two Aria charting albums, and most recently a #1 on CMC with Aleyce Simmonds. 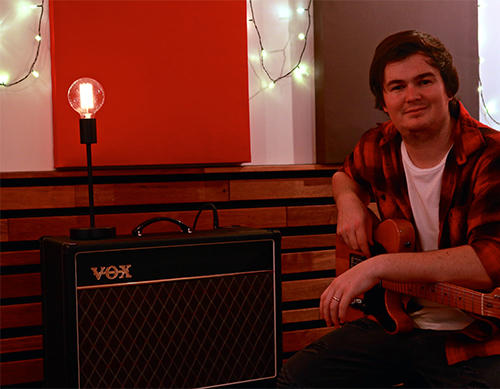 He also owns and works out of Machine Lab Recording, a recording studio based in the Gold Coast Hinterland and is currently flat out with clients ranging from Country and Folk, through to Pop and Rock. 2018 started off with a bang, with Jared picking up a Golden Guitar when Aleyce Simmonds won Female artist of the Year with her album ‘More Than Meets The Eye’, of which Jared Produced, Mixed and Performed on. Jared is currently on tour with Tori Forsyth and The Spurs in support of Tori’s latest single, ‘In The Morning’, and is also working on the follow-­‐up release to The Spurs’ critically acclaimed instrumental single ‘Stampede’.